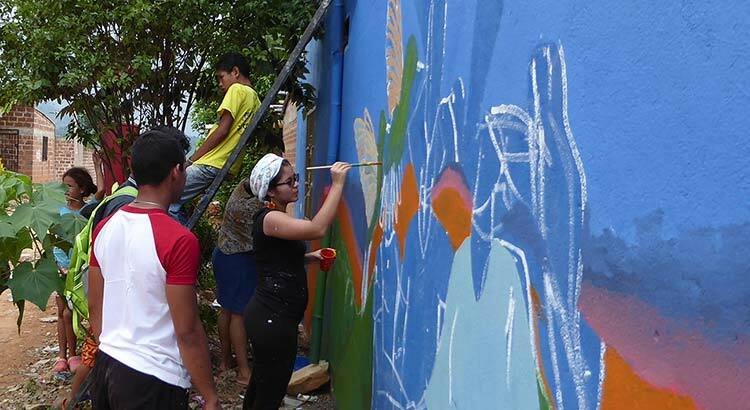 Civil society participation and gender are two of the most relevant cross-cutting approaches that characterize the implementation of the Colombian peace agreement. Some observers regard it as an international landmark in peacebuilding because it places gender equality at the center of the implementation. Regarding the participatory component, the peace deal follows the idea according to which, if citizens are directly engaged in the public decision-making, then the State will be more legitimate and responsive to their needs, and thereby, less exposed to be captured by particular interests. In consideration of these two approaches, the peace agreement created the Development Programmes with a Territorial-Based Focus (DPTFs) to engage citizens in public decision-making related to the postconflict rural development. The objective of the DPTFs is to generate a “detailed inventory” of necessities regarding infrastructure and public goods in the territories, and also the specific projects to address such necessities through bottom-up development planning and management. Despite that such plans should be elaborated with “broad” and “pluralist” participation from civil society and with a “gender approach that recognizes the particular needs of rural women”, from a total of 38.865 participants in 404 participatory meetings by January 2018, only 38 percent were women. More puzzling is that a Colombian think tank found a minimum of 19, an average of 40 and a maximum of 83 percent female participation from a sample of 12 workshops studied. The think tank determined that “there was not always a differentiated strategy to summon women.” Finally, the monitoring committee established by the agreement to guarantee the rights of women in the implementation has expressed a lack of proper inclusion into the DPTFs process, and has requested the Government to make public how was the gender approach included in the participatory methodology. The research that I summarize here did not study the implementation of DPTFs by the government. Rather, it analyzed potential causes of the lack and variation of female participation. To do this, I investigated the individual level factors associated with the civic engagement of women and their participation in municipal meetings using survey data from the AmericasBarometer Project collected in the peace implementation territories between October and December 2017, one year after the signing of the peace agreement. The analysis focused on civic organizations and municipal meetings because of the government’s strategy is to build the development participatory plans by involving civil society organizations in municipal meetings. The question that guided the study was: to what extent do women participate differently in civic organizations and municipal community engagement? Before proceeding into the empirical results, it is worth noting that more female presence in the political structures does not translate automatically into a political structure with an agenda committed to gender equality. However, the fewer women in such political structure, the less heterogeneous such structures is, and therefore, the lower the possibilities to advance in terms of gender equality, a Colombian scholar has underscored. Following this, I focused on the female presence in the civic associations and the political municipal arena rather than an analysis of an agenda representing gender equality in these structures. 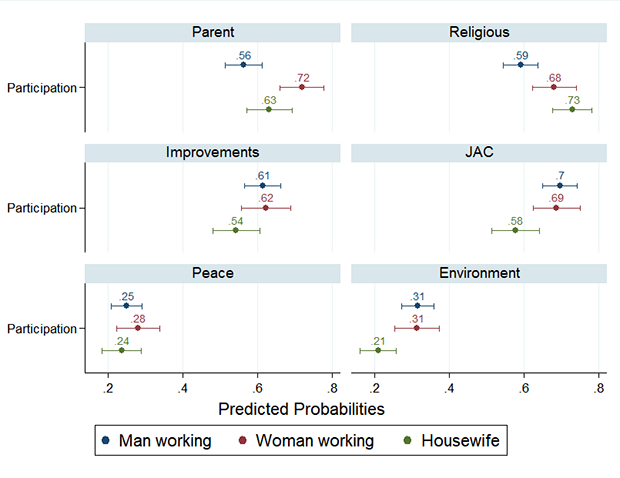 Controlling for demographic characteristics and other factors that affect civic engagement, Figure 1 presents the probabilities to participate for housewife and a man and woman in the workforce in six civic associations: religious, parent-teacher, improvements, peace, environmental and local action boards (JAC in Spanish). The JAC are voluntarily civic organizations integrated by the residents of a neighborhood on the basis of participatory democracy. Figure 1 shows that occupational status plays an important role determining the civic participation for men and women. While women in the workforce tend to behave as their male peers, homemaker women tend to engage less in civic associations. Working men have a 70 percent probability to engage in community action boards (JAC), while housewives have 12 percent lower probabilities to do so. Working men have 31 percent probabilities to take part in environmental groups, whereas housewives have 21 percent chances to do that. Conversely, homemaker women have a 73 percent probabilities to participate in a religious group, which is 14 percent higher than working men. These probabilities are not by random chance since they are statistically different with a 95 percent confidence interval. Despite that the participation in improvements association is not statistically different between men in the workforce and housewives, there is a 7 percent difference in favor of men. To observe the relation of occupational status, voluntary civic engagement and municipal participation, and controlling for the same covariates in Figure 1, Figure 2 presents the probabilities to participate in municipal meetings for three categories: men and women in the workforce and homemaker women. The blue coefficients are three categories when civically engaged, and the red coefficients when the categories are not civically engaged. 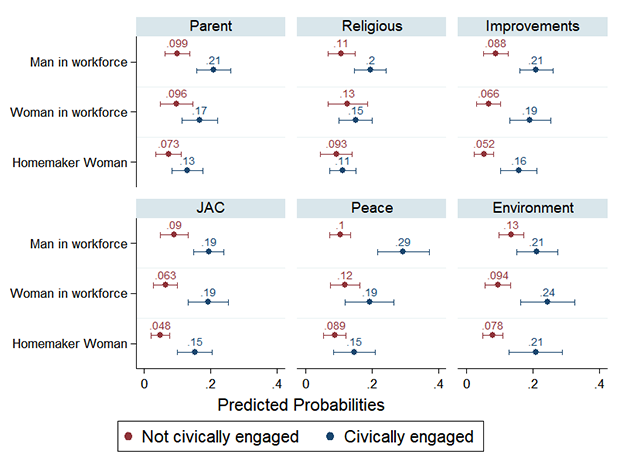 Figure 2 shows that men in the workforce engaged civically in community action boards, parent-teacher, improvements and peace groups have a statistically significant higher participation in municipal meetings than their peers that do not engage civically. Regarding the participation in municipal meetings of women, when they engage in community action boards, improvements and environmental groups, they have a statistically higher participation in the municipality, in comparison to women that do not engage civically. This is both for both housewives and in the working force. Figure 2: Probabilities to participate in municipal meetings for men, women in the workforce, and homemaker women. Wrapping up the findings so far, Figure 1 evidenced that homemaker women tend to participate more in religious and parent-teacher, and less in community action boards, improvements and environmental groups. Considering the results from Figure 1 and 2 together, the observed gender gap in the DPTF process can be interpreted in the following way. In comparison to both men and women that work, homemaker women have lower probabilities to engage in the voluntary civic groups that promote the assistance to municipal meetings. Since civic participation is positively associated to municipal participation, homemaker women have lower probabilities to engage in the public sphere of municipal meetings. Thus, the gender gap in the participation in the public sphere of the Colombian postconflict municipalities is more nuanced than usually assumed: It is not women per se but a specific subgroup of women, namely the homemakers, that participate less in the communitarian sphere. Civil society participation and gender are two important cross-cutting approaches of the peace process implementation. Although the government has trained the territorial teams developing the participatory methodology to encourage participation of rural women and increase the effectiveness of their civic organizations in the participatory workshops, female engagement has not met the standards stablished by the peace agreement yet, as it was stated above. The DPTFs are an opportunity to overcome the historical distrust between local communities and the government due to their salience and the expectations generated to improve the livelihoods of people in rural conflict-affected regions. However, the lack of female inclusion is a risk that can hinder the effort, and thus become a new source of citizen discontent with the government peacebuilding strategy. I show in this analysis that there is a potential to promote the participation in municipal meetings of homemaker women that take part in these civic associations and, thereby, reduce the gap. The policy recommendation for the Colombian government is to have more sensitivity in the type of civic organizations that are called to the participatory peace implementation mechanisms in order to increase the presence of homemaker women in these community spaces. This could be done, for instance, through promoting the participation of those civic groups in which housewives tend to concentrate: religious and parent-teacher organizations. 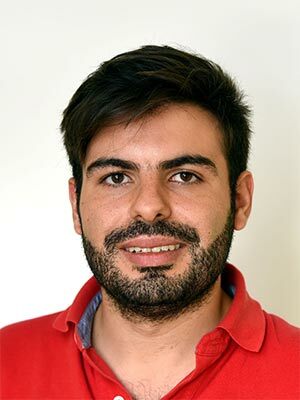 Eduardo Acostamadiedo completed a Bachelor of Arts in Political Science from Universidad de los Andes in Bogotá in 2015, and recieved a Master in Public Policy from Hertie School of Governance in Berlin in 2018. He has worked as a political analyst at the the International Organization for Migration Mission in Colombia and was an intern at PRIF in the summer of 2018.